​Sweet melons make fantastic drinks. While watermelon gets a lot of attention, don't discount other melons like the cantaloupe and honeydew in your home bar. These fruits can be combined with a variety of liquors and flavors to create some very impressive cocktails. Most of these recipes feature fresh melon as a primary ingredient, giving you one more way to enjoy the tasty fruit while it's in season. If you haven't tried a cantaloupe or honeydew cocktail yet, here's your chance. Sweet honeydew juice is a fantastic ingredient for a variety of cocktails. It pairs nicely with white spirits, such as the gin we see in the long hope cocktail from OandO Eats. The recipe is simple to make and has a fascinating flavor. You'll mix fresh cucumber and mint with honeydew and lemon juices. Choose your favorite gin, though you may find it best with softer profile gins like Hendrick's or Aviation. Light, refreshing flavors are the perfect pairings for the honeydew melon. The honeydew punch recipe from Jules Aron's book "Zen and Tonic" takes this to a fascinating extreme. In this tequila cocktail, you will find many stimulating flavors. From the lemongrass syrup to the fresh cantaloupe, mint, and basil, it's one to tantalize the taste buds. This is made by the pitcher and perfect for summer parties. Cantaloupe is a bit bolder than honeydew and it too offers some fun possibilities in cocktails. In the summer melon cooler, the bartenders behind the Flair Project have created a delightful flavor combination. For more of a standard melon margarita, this recipe from Urban Bliss Life is an excellent choice. It's a simple blended cocktail and an ideal way to use up leftover cantaloupe. 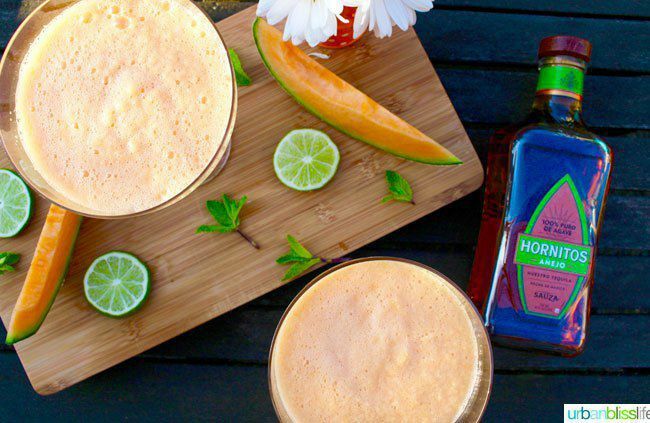 The cantaloupe margarita features an añejo tequila, so it gets a nice oakiness to play off the sweet melon. Agave nectar is the sweetener of choice and fresh lime juice is required. Try it with the mint garnish for another layer of flavor. When you're ready to add a little kick to your cantaloupe, simply turn to ginger. It is one of the best pairings for the melon. The first taste of the cantaloupe ginger cocktail from Lexi's Clean Kitchen will make you a believer. A gluten-free vodka from Stoli is the liquor of choice here. You'll add honey, a cantaloupe puree, grated ginger, and fresh lime. It's that snappy spice of the ginger that makes it memorable. The frozen daiquiri is another cocktail that can do with a melon twist and honeydew is the star of this simple recipe. You'll definitely want to spend some of your summer with the frozen honeydew daiquiri from Salted Plains. The recipe is much like any other daiquiri, complete with white rum, lime juice, and agave nectar. When you add fresh honeydew and give it a whirl in the blender, a magical drink is created. Melon balls are a fun garnish for any summer cocktail. You can even create a bunch and freeze them to pop into your drinks whenever you like. They also add a subtle flavor, as we see in the honey deuce cocktail. This refreshing vodka lemonade recipe is incredibly simple. It pairs a great vodka with fresh lemonade and sweetens it with the raspberry flavor of Chambord. Add a skewer of honeydew and sip away on a lazy summer afternoon. Fresh cantaloupe and honeydew melons are not available year-round. In the off-season, you can still enjoy the sweet taste of melons with ingredients made from the fruit. One of the best-known melon options is Midori Melon Liqueur. It's flavored with Yubari king melon and musk melon and it's fantastic in cocktails. 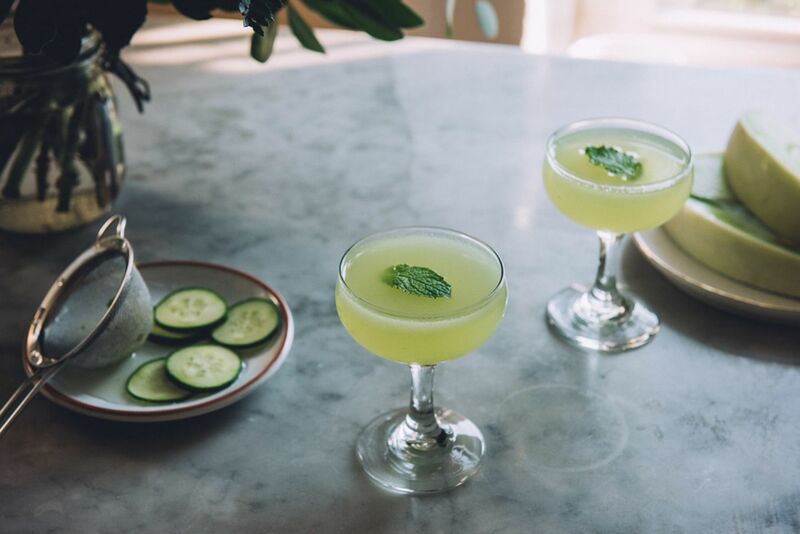 The Japanese slipper is a perfect example; a simple recipe of Midori, Cointreau, and lemon juice. It's a sweet, fruity, green martini you'll fall in love with. Included in the 20 ingredients used to blend the sake-based TyKu Liqueur is the honeydew melon. This liqueur also has a brilliant green color that rivals Midori's, though it has far more dimension in the flavor department. The blushing geisha is one of our favorite TyKu cocktails and the recipe is extremely simple. It pairs the liqueur with pomegranate juice and rose nectar for a floral, fruity sipper that's ideal for any occasion. The variety of flavored waters available also make interesting mixed drink ingredients and a number of them feature melons. Among the most widely available brands is LaCroix, who offers a refreshing melon pomelo sparkling water. That is a featured ingredient in the tropical rooibos cooler recipe. This mocktail takes iced tea to a new level, pairing the fruity water with smoky rooibos tea, pineapple-banana juice, and lemon syrup. It's a healthy drink and the flavor blend is fascinating.